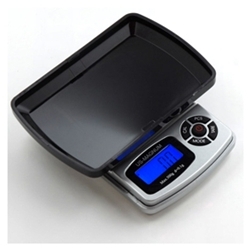 The "Magnum" digital pocket scale manufactured by US Balance needs very little introduction: simple, easy to calibrate, easy to use, accurate and durable. The Magnum features a bright blue backlight, silver casing, and dark tinted cover. Ready to use out of the box this instrument is packed with handy features, and comes with calibration weight included, so you'll always have tight control over every result. The parts counting function (PCS) makes it possible to count large quantities of parts of the same weight. The Magnum stands up to units twice its price. A great value! - Overall Size: 2.875" x 4" x 1"
- Platform Size: 2.125" x 2.125"